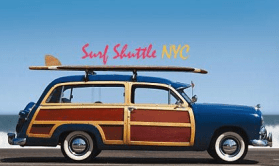 Starting this weekend, the 15-seat van will be making hour-long runs from the Lower East Side to a secret spot in Long Island, west of Jones Beach. The van’s first departure from Lost Weekend‘s Orchard Street shop (where free Blue Bottle will be on offer) is this Saturday at 8:30 a.m. Starting next weekend, there’ll be morning departures on Fridays, Saturdays and Sundays, with returns within five to eight hours depending on the vibe. Alcocer is taking August off (he’s surfing in Mexico, duh) but will pick up the runs in September. At $50, the fee isn’t as cheap as the Ramones’ preferred mode of transport to the beach, but hey: when you hitch a ride you don’t get a free cold lunch and the knowledge that a portion of profits go to the Rockaway Waterfront Alliance. To reserve, send a Facebook message, or just e-mail SurfShuttleNYC@gmail.com.